Little known fact about me – I have a Bachelor’s degree in English. My first love has always been words. Growing up I was the kid with her nose constantly in a book. This also explains my love for writing and why this little blog nurtures my creativity so much. So as you can imagine, this wordy trend in interior decorating and design is my jam. I am so all about this word obsession! Pillows, signs, picture frames – bring it on. 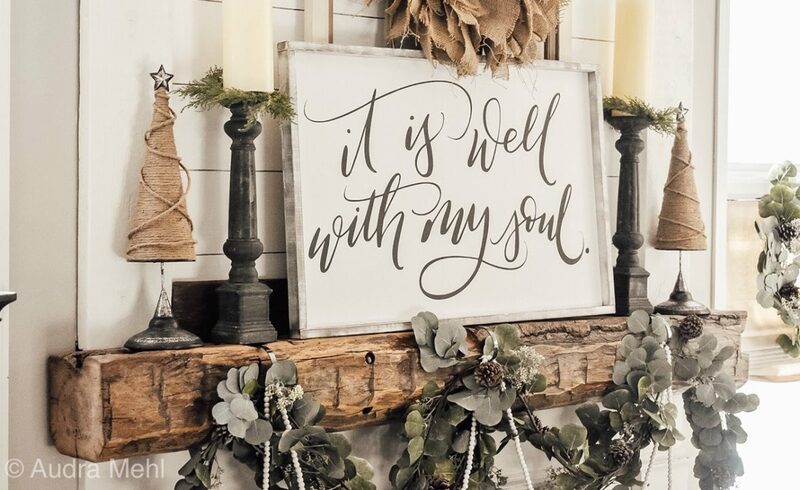 Anywhere I can tuck a phrase or meaningful word into my home through decor, I am all about it. Subsequently, when it comes to the inventory in my farmhouse chic shop, Grace 1972, we have the word mother load. Pillows, signs, coffee mugs . . . I have it all. I thought I’d blog today about how I tuck words into my own home decor. Words are our connection to one another and I love how our home tells our story. Come with me and I’ll give you a little tour. The first stop is the hallway between our main entry and kitchen where two signs that say a lot about our family are displayed. I am definitely a home body. I love nothing more than a Saturday night on my couch and in my sweatpants with a nice cup of tea with honey! I can blame old age but the truth is I’ve always been this way. When I was single between marriages, I really missed this aspect of marriage – someone to snuggle with and watch movies on weekends. I really hated being “out and about” all the time. I went out on weekends my daughters were with their dad only because I hated the loud silence of my home when they were gone. I am very grateful for the gift of my second marriage and the fact that we are often . . . home on the couch on weekends. It is blissful and I love it. The Antiques sign is from the Joanna Gaines Magnolia line and 100% me. I love antiques so much I’ve blogged about them many times. Vintage is a reminder of our part in the larger story of humanity and a reminder that time passes swiftly. Once we get to our kitchen you’ll note several more signs. This one in our informal dining area just makes me feel happy. And the Cottage sign above says there is beauty in simplicity to me. We downsized last year from The River House to The Lighthouse and it honestly brought a lot of peace to our lives when we simplified our existence. This sign is a reminder of that wonderful decision for me. Our parlor is adjacent to our kitchen and two signs in this room also say a lot about our family’s values and journey. Snuggled next to Iris is what I view as a simple formula for happiness. Be these things and life will be joyful. The chalkboard above our sofa is a word that my husband chose, Sanctuary. We’ve had our ups and downs but in the end we both want the same thing, for our family and home to be a sanctuary. This word is a nice reminder to us both to continue to work every day toward that end. Next to our parlor is my other happy place, my home office. I’ve blogged a lot about transitioning this room’s evolution and I can honestly say it is my favorite room in our home. That is a good thing when I spend 8 hours a day working from here! The sunshine is energizing and of course, I’ve filled it with items that I love. This Vintage sign hanging above my family’s heirloom crib that I’ve repurposed for extra seating is one of my favorite statements. Obviously, this pretty much sums up how I love to decorate – with lots and lots of vintage! A few other places I’ve tucked in some words are in our living room, dining room and kitchen. The pictures below showcase some of my design choices for placement that are meaningful to me. Thank you so much for stopping by my word tour! I know many people feel a little intimidated by using words in their decor choices. I hope this post provides a little inspiration and ideas for how to incorporate this trend in your own home. On a final note – I had a big gap in blog posts and I am so sorry! I started with a new software consulting firm at the same time that I opened Grace 1972 – not even making that up. (Life always clusters big events, doesn’t it?) and the blog went on the back burner. Things are settling into a better cadence now so I plan to continue to post weekly, thank you so much for following along! If you’ve been a regular reader you’ll note that I updated my template – I like this one so much better. What do you think? I hope all of you are having a great “almost spring” – I try to be at Grace 1972 daily between 5pm and 6pm when I am not out of town for work, if you want to stop by and say hello sometime, please do, I would love to meet you. OMG, I wish I could buy your house and make you leave everything. fantastic.